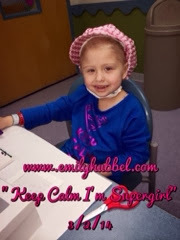 I am continuing to be in Prayer for Emily!!!! She looks to be feeling better cause her ever so sweet smile is back!!! Praying that God leads someone to a cure for Neuroblastoma, very soon!!! No child should have to go thru all of this!!! !